– Ceramic coated all aluminum cylinder (no steel sleeve) – Lightweight high compression domed 60mm piston with rings, pin, & clips – Head gasket kit – Now includes the cylinder head o-ring set and an exhaust gasket. The all aluminum ceramic coated cylinder is lighter than a steel sleeved aluminum cylinder, reduces friction (increasing power), improves sealing, and provides better heat transfer (runs and cools down quicker). 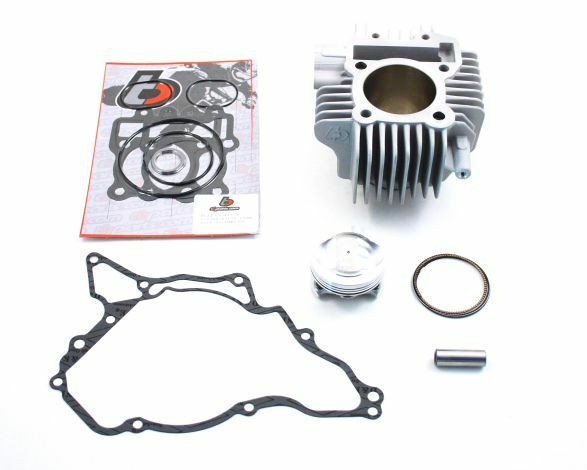 This new cylinder along with a complete head gasket kit and domed piston will provide the extra power to make your new Z125 a lot more fun to ride! Additionally, this is the biggest bore kit you can install without needing machining to the cases (case boring). These are high quality parts and definitely will dramatically increase the power and fun factor on your bike! There are no installation instructions, but if you can replace your piston, you can install this kit as the parts are installed in the same manner as the OEM parts. However, its highly recommended that a professional install this kit and make sure its tuned properly – An aftermarket fuel controller is required and possibly an autotune will be needed to prevent a lean condition and damage to your engine.